Annette C. Giaquinto, Ed. 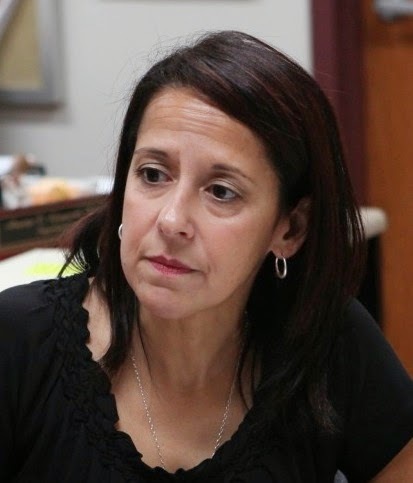 D.
On August 13, 2014, Galloway Township Superintendent of Schools Annette C. Giaquinto addressed in an email to members of the School Board and Staff, the upcoming planned protest against the recent tax increases scheduled for August 19, 2014 at the Township Municipal Complex. Giaquinto stated in an email to the Board and Staff, "For those of you that live in Galloway (and perhaps others), you may be hearing about a group that is going to the Town Council meeting on Tuesday to complain about tax increases. Apparently, statements have been made indicating that the increases are because of the school district." Giaquinto appears to address the issue after Township Manager Susan Jacobucci sent an email to her on August 12, 2014 stating, "Mayor Purdy and Council have asked to have a school representative at the Tuesday August 19, 2014 (6:30pm) Council meeting to discuss the schools’ role in the taxes." In the emails Galloway Township News obtained, Giaquinto does not confirm someone from the School District will appear at Galloway's Council Meeting as requested on August 19th. Residents in the community have planned a protest that evening to voice their concerns on the significant increases on this years tax bills. Giaquinto appears to disagree with the various comments that were made to the media that the school district is responsible for the tax increase. "Tim is working on some data that will show that our district has only minimally contributed to the tax increase in recent years and that the Township is responsible for the largest portion of the increase" Giaquinto said in the email. "I remind all Board members that by policy the Board President is the spokesperson for the Board, and the Superintendent is spokesperson for the district. If you are questioned by any member of the public, media/press, or Town Council, please direct them to Ernie or me and also suggest they attend our meeting" said Giaquinto. "With Joanna’s assistance, I am monitoring the various print and electronic news sources." Giaquinto firmly states, "I also communicated with John Keenan, the Greater Egg Superintendent, and Ernie spoke with Carol Houck, Board President. Greater Egg has the same position as us – if you wish to discuss the school district budget, attend a board meeting." Mayor Don Purdy did not return our request for comment on the tax issue. Purdy did however comment to the Current by stating, “The problem is due to all of the tax appeals that we had, everyone was not paying equal." The Municipal Building is located at 300 E. Jimmie Leeds Road and the meeting is scheduled to start at 6:30 p.m. on Tuesday, August 19, 2014. "Tim is working on some data that will show that our district has only minimally contributed to the tax increase in recent years and that the Township is responsible for the largest portion of the increase"
The data should already be there, it shouldn't have to "be worked on". Sounds like the GTPS is trying to come up with excuses to justify why they need 60% of Galloway residents tax bills. The data is there. Any town you go to has a similar percentage go towards school taxes. How much did each piece go up? That's what we need to know. The school taxes I pay are 60.52%. What data is going to be manipulated to try and portray that as a rational number? This current increase aside....why doesn't she explain that and have her number jockey figure that out. I see data and number cherry picking by the township school district currently in the works. 60% is way too much and unjustified. That is why this township can't hire police officers or public works employees as the public schools insist that they are more important. Instead of going to a council meeting, why doesn't everyone flood the next board of education meeting like myself and a few other residents plan on doing? Or even better run for the school board and vote the current sitting members out? Check the superintendents waste of money on unnecessary postions: their job descriptions, pay and experience. Positions are even created so they have a job. If you are a friend you have a job. Check some of the principals postion experience and time in education. Would you like a preschool teacher coming into GTMS and teaching and eighth grade class? You are paying an individual who has limited expereince in education and was given GTMS administration positon from preschool no wonder the school has gone downhill. Investigation on supervisors and ridculous postions given to befriended teachers who are to assist teachers as learning consultants. Their requirements personal friends of Giaquinto or have relationships or married to other adminsitrators. It used to be called the Good Old Boys now it is the Good Old Girls. New board members are needed because she has been heard saying they will do whatever I want. Time to clean house and get our schools back to where they were. It is amazing how clueless some people are. Dr. Giaquinto is the consummate professional and would never make a remark like that attributed to her about her relationship with the board. School districts are under intense scrutiny by the Dept. Of Education, particularly in regards to hiring staff. Boards of Education, and the Galloway board is no exception, do not appoint and hire staff on a whim. Read the Education Statute 54 and the associated regulations and the board policies and regulations oo to better understand the procedures that are to be followed by law. It is easy to attempt to smear any person or group by rumor, inuendo and half truth. There is always someone who might believe you. Be thankful there are leaders in education like Dr. Giaquinto and the Galloway Board, who truly understand the issues and work hard to solve them in an effort to provide our children with the best education possible, given the constraints under which they operate. Planning a protest over the tax increase is certainly understandable, but residents need to know the facts before pointing the finger themselves. I work for the school district and also have children who attend our schools. I can tell you firsthand that there is no “waste” that could be cut without significantly affecting the quality of our schools, which is Galloway’s greatest asset at this point, even if you don’t have school-age children. Property values would sink even lower if significant cuts were made. The school district must stay within a state-mandated budget cap which is why there has been no vote in recent years. The municipal government has to deal with a similar cap. And while tax appeals may have affected previous budgets, the revaluation should have leveled that playing field. The main reason for the tax increase is a lack of new revenue, which would come from commercial ratables. The math is simple; when costs go up (and they always do), you need to bring in more revenue (which hasn’t happened). The council needs to take responsibility for this instead of pointing the finger everywhere else. Our taxes went up over $1,000 on a modest home, which we aren’t happy about. If it weren’t for the quality of our schools, we would surely be looking to move out of the township. I don’t blame Dr. Giaquinto and school officials for preparing information to defend their budgets, and also for not wanting to attend the council meeting. They are being thrown under the bus by township officials who want to take the heat off themselves, which is wrong. Mayor Purdy needs to be reminded that his own children attend our excellent public schools that he wants to point the finger at. Let’s get to the root of the problem: we need to get the lawsuits under control, stop passing the buck, and start bringing new business into the township. That is certainly within council’s “control”. Agree one hundred percent with last post. Could not have said it better. Township officials are trying to deflect the blame for wasteful spending and expensive law suits/settlements. How out if touch with reality can these people be? I hope everyone shows up tonight to express their concerns. What the Township did was nothing more than a tease with lowered assessments at a time of the year where no one would reap the award. It saddens me that the township offers nothing. No trash removal ($400.00 per year for me) no brush removal, leaf removal occasionally twice a year, One weekend a month for you take you tree limbs to the recycle plant, the list is endless. I tried to look at the budget and understand it.... it is in a language all of its own. The schools are a big part of the issue with taxes being raised every year "pass the budget, pass the budget" I ask how many of these teachers live in Galloway and feel the crunch? My two children went all through Galloway Township school system. It is wonderful, but it is overloaded!!!!! Maybe start taxing some apartments that have about 6 to 7 children residing there to attend our schools. I could go but its senseless. My plan, I will appeal, I will fight for my allegedly $300, 000.00 to be worth $150,000.00 just to lower my taxes and they will be lowered. I haven't seen a home sale in Galloway for 300k in years......! "I see data and number cherry picking by the township school district currently in the works. 60% is way too much and unjustified. That is why this township can't hire police officers or public works employees as the public schools insist that they are more important. Instead of going to a council meeting, why doesn't everyone flood the next board of education meeting like myself and a few other residents plan on doing? Or even better run for the school board and vote the current sitting members out? " Please come to the board meetings instead of blindly rejecting school budget votes. Find out what is going on instead of complaining about your tax dollars being wasted in the school districts. Are you in bed with someone trying to spread the propaganda of the school district being the money pit of Galloway ? Hire more police ? I'm all about the men and women in blue, but add in the presence of the Stockton police and there is a decent sized department already . Get your facts straight before you shoot your mouth off! Your comments are so far from real facts, they might as well be from Krypton! Loser! "Hire more police ? I'm all about the men and women in blue, but add in the presence of the Stockton police and there is a decent sized department already." The Stockton College Police only do traffic enforcement in Galloway Township, other than that they are not a substitute for the Galloway Township Police Department. Extremely clear that this came from a public school educated person. Like I said I likely will take the initiative along with numerous other residents to run for the school board and mandate cuts!!! I have never used the public schools in this township, I have always used private schools for my children. Instead of having everyone pay, why don't only those that use the public school systems pay the portion of the taxes for the public schools? No one is "blindly rejecting school budgets". No one can afford the constant referendums calling for tax increases! So stop asking for more when people can't afford it! Before you pop off about you sending your children to private schools in Galloway and not using tax dollars check the facts !! Transportation, Nurses, Special Ed programs are funded by the taxpayers of Galloway. Oh by the way, when you went to school other people helped your parents pay for your education and now that it is your turn you want to change the rules !!!! Those are state laws and anyone with common sense knows that. I never said that I wanted to change the "rules". So before putting words in my mouth why don't you look back and see how your comment demonstrates the greed of the public school systems!!! "Only those that use the public school system pay the portion of the taxes for the public schools". I did not put those words in your mouth, Check your previous post !!!! Now who sounds greedy !!! "Instead of having everyone pay, why don't only those that use the public school systems pay the portion of the taxes for the public schools"
Please make sure you post my entire statement before botching it into pieces. If you used something called understanding the context of a statement, you would be like everyone else and see that my statement was not hinting at greed. I guess that the public schools did not teach you that in all of the years that you used their system. Sad to see that our tax dollars go towards under-educating people. Oh Yeah you sound real educated !!! I left out instead of having you pay !!! I can see where your private school education really made you an intelligent person !! Thank god for public schools !!! At least I know how to properly punctuate. I never knew you left a space between words and exclamation points (or any form of punctuation). That and when a quote ends a sentence you always put the period inside the quotation marks. I guess that your public education taught you to put it outside the quotation marks which is grossly incorrect. Please make sure to use spell check in Microsoft Word before leaving another poorly formed statement that you feel is grammatically correct. At least we can both agree that we are both proud of our educational backgrounds. This person hiding behind an anonymous name sounds like a complete fool. They can't even punctuate their sentences correctly along with not capitalizing certain words and capitalizing words that should not be capitalized. I am glad to see that they are proud of their poor educational background. A prime example is of Dr. Jerri Lynn Gatto at Absegami using a taxpayer funded sign to thank "donators" instead of donors. I guess you haven't mentioned that sign as you believe that's how you refer to people who donate money or you can't read overall. Ask any college professor and they can immediately tell who was educated in a public school vs. someone who was educated in a private school (private school students have better grammar skills and sentence structure). Thank God for Private Schools educating our young children properly and preparing them for the future! And you are not hiding behind anonymous name. WOW. I really can tell that you idiots were educated in private schools, If you check the facts, Galloway Public School children test scores are so much higher than your so called private schools it is pathetic !! I can tell by your idiotic remarks !!!! Those are statistics from high school, I hope that you know which numbers are higher. As for elementary schools my neighbor who is a public school teacher even acknowledges that the standardized tests used in public schools do not even compare to the standardized tests used in public schools. That came from a public school teacher! Before trying to make remarks that you feel are insulting (which aren't working and make you look foolish), stop and ask yourself why you reverse what I say and attempt to use it in your favor. You have two people telling you that you look like a fool with your false remarks and publicly educated spelling and grammar. Please use spell check in Microsoft Word before making another comment so anyone can view your overall argument as constructive. I completely agree with the person that commented at 7:31 PM!!! Whoever this person is, is clearly getting agitated and upset to the extent that they are now resorting to personal insults to get a very false and nevertheless unclear message across. They do not even directly address the major disgrace of the electronic sign at Absegami. Someone asked them to use spell check before posting another unclear comment. However, this person chose to start a sentence with "and", along with going off on a very disorganized rant. I never knew that using incorrect grammar and punctuation resulted in higher test scores in our society, never mind our planet. Makes me ask whether or not this person is mentally stable. By the way, I was educated in a public school all my life and never learned to start a sentence with "and." I am a teacher in the Galloway Township Public School district. Our test scores are right about average in the State of New Jersey and continue to improve by the year. However, our standardized testing (NJASK) cannot be viewed on the same basis whatsoever with the standardized testing used in private schools (ITBS). Private schools do not have to accept every individual child into their school (more stringent admission requirements), therefore they cannot be compared in that aspect as well. That is why scores are higher in private schools on widely used standardized tests such as the ACT or SAT. Both private and public schools offer great things for children. It is a matter of what the parent wants for their child. I kindly ask that those who want to present the case for public schools (and private as well) to consult with a administrator or teacher to ensure that they have accurate information. This will help both sides to better present their case rather than have someone provide false information and resorting to unnecessary insults, such as the anonymous poster advocating for public schools. I feel that the teacher who posted the comment above could not have put this in a better way. It is wrong to go after one another for what they think is better. I do not think that anyone would act like this in public so I have no idea why they would on an online website.